The heart of Google is still the search engine. It started in 1998 and nowadays it has a market share of almost 90% in Europe and about 60% in the USA. The main competitions of this search engine are Yahoo and Microsoft Bing. Yahoo has 21% of market share in the USA and 3% in Europe. Bing has 10% in the USA and 3% in Europe as well. There are many other small search engines which either use the database of one of the three market leaders or have a market share of less than 1%. The market of search requests will grow another 10% in 2010, so the three market leaders keep fighting for every percent of market share. 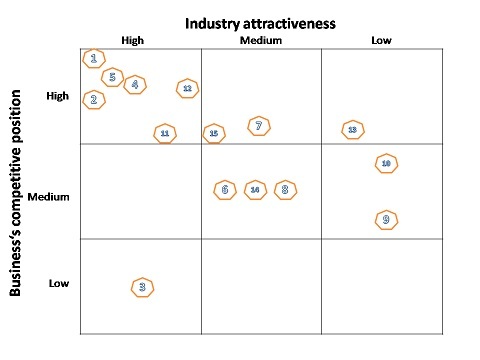 The attractiveness of this sector is still growing. Although Yahoo and Microsoft cannot reach Google, they try to attack the market leader. Microsoft recently attacked their competition with a new search engine called Bing. Experts suggest that Microsoft at least can outstrip Yahoo in the next few years (DigitalBeat, 2009). The Google search engine is still the number one in a high attractive market. They will maintain their strong leading position, so they should further invest in their main business (Webhits, 2010). Because of the strong growth of social media platforms on the internet, YouTube was founded in 2005 by three private people. The objective was to offer a free portal where user can upload their videos (Hopkins, 2006). Even one year later, in 2006, Google discovered the enormous potential of this portal and bought it (Lynch, 2009, p.4). In 2009 YouTube had a market share of 73% in the sector of video portals. But there is no other competition which really could attack their strong market position, because the next competitor is Google itself with its own video portal. It has a market share of about 8%. Other competitors are Myspace.com with 8% and Yahoo Video with 4%. One of the strongest threats of YouTube is that it often has problems with the copyright law. Everyone can upload music videos from TV or other internet sources, so there are thousands of videos which violate the copyright of their producers. If YouTube does not want to risk a penalty which could cost them many millions of dollars, it always needs to negotiate with the worldwide music industry. This means a great effort, but it is important for defending their leadership in the video portal industry (BBC, 2007b). In 2006 YouTube had a daily retrieval of 100 million videos. In comparison with the statistics of 2009, where they had a daily rate of over 1 billion videos, the market is still growing and Google has to defend its market position with further investments. This brand has a strong competitive position, as well as high industry attractiveness just like the search engine (Hurlay, 2009). Since September 2008 Google has its own Internet Browser called Chrome. Google intervened with that in the browser war between Microsoft and Firefox. This two market leaders together have a market share of 95%. Therefore it would be hard for Google to gain a foothold in this industry. At the moment, January 2010, the Chrome Browser has a market share of only 0.3% but a powerful company like Google is able to publish its own products in another brand like YouTube. Google puts a lot of effort in advertising its new browser in its own search engine as well as in YouTube. Therefore it has a unique selling proposition for browsers in these web portals. Besides the majority of internet users do not know that YouTube is a brand of Google, so the Chrome banners in YouTube do not appear to be pushing their own products within their own portals (Webhits, 2010). The main reason why Chrome up to now could not gain acceptance is that people fear a loss of their personal rights through a violence of data protection. With the standard settings the Browser sends user data to Google, so people assume that Google creates user profiles to spy on them. This caused a bad reputation which makes it harder to convince internet surfers to change from Firefox or Microsoft to Chrome. Although the browser is faster, clearly, people still do not trust it (Caspers, 2008). The competitive position of Chrome is still weak, but with an improvement of their reputation they could gain a further market share, because the product is well-developed and in some fields better than the browsers of the competitors. The industry attractiveness is high as well, because of the brand awareness users have choosing this browser. The project to make images of the whole world public is unique. In 2005 Google started with its web service Maps, where the user can see the world as a map or with a satellite. Maps uses the same material like the software Earth but without 3D views and with a lower resolution for making it available online. Since summer 2008 Google offers within Maps the new service Street View. One can move within a digital environment through their city. A special car is driving through the cities and shots panorama photos from every street (Brown, 2006, p.4). AdWords and AdSense are the only brands of Google which are not for free. These services are the pillar of Google’s success. In 2000 Google started putting small adverts in search results for the first time. Formerly Google said that they did not want to put adverts on its pages to stay independent. Companies can advertise within the Google results or within other web pages participating on the AdSense programme. They only pay for these adverts if someone clicks on the banners they offer. This is Google’s only source of income, but with this model it is sufficient to be successful worldwide. Google do not charge a fixed price for each click. The charge depends on the importance of the keyword and what advertising companies are willing to pay for it. Each keyword works like an auction, so it is a self-regulating market without Google influencing the price (Fischer, 2009, p.231). This model is so successful that the whole online advertising market adopts Google’s prices. Search engine optimization agencies also use the AdWords model to set their prices which they charge for optimizing a web site for a particular keyword. As the competition use the AdWords model for doing benchmarking, this brand also has a very strong competitive position in the market. Because of the still increasing amount of online adverts the industry attractiveness is still high as well (Sistrix, 2007). There are many other Google projects which are more or less successful. Some of than are probably too small to call them brands. Some of them are G1 Mobile, Images, Translator, Docs, Picasa, Gmail, Books, Desktop, Scholar and Toolbar. Google offers for all its new services and products a development environment where users can help improve their products. This is one of the key points of Google’s success. People help develop products and they decide if it is worth further investments or not. For instance Google ended in December 2009 three projects called Jaiku, Dodgeball and Notebook because users did not like them (DerStandard, 2010). No product leaves the beta-phase, if there are not positive reactions from the internet users. Therefore most of Google’s brands you find in the GE-Matrix within the “Invest for growth” sector.